There are all kinds of shady digital marketing methods in Zimbabwe involving email. It ranges from the outright digital tsotsis who sell so called “email databases”, essentially making businesses pay to get their hands on a list of email addresses to spam, to milder spammers who make it their job to build these databases, not for the purpose of selling them but to charge companies a fee for each mailshot of spam sent to these emails. Essentially, this guy is selling a database of WhatsApp numbers to whoever is ready to buy. We didn’t respond to him unfortunately so we can tell you how much 33k numbers cost. Unfortunately for this spammer though (or maybe it’s really just unfortunate for whoever will buy) unlike email, which is an open decentralised platform not centrally run by someone, WhatsApp is owned by a company and this company controls who can send what on their platform. 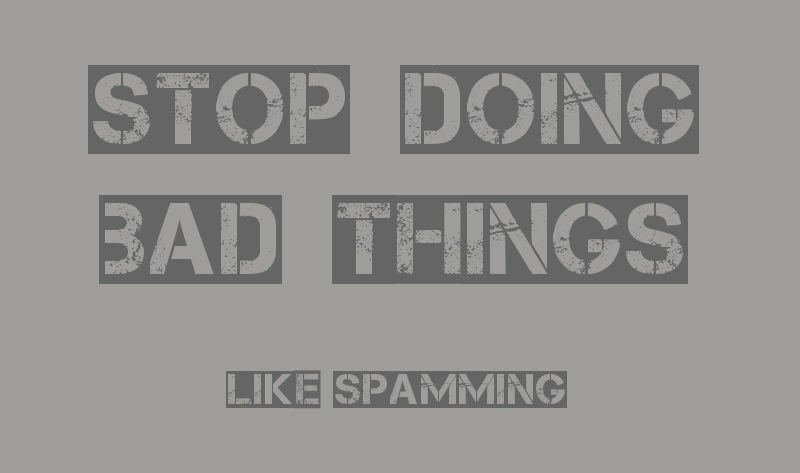 So selling or buying databases and doing marketing via the good old email type evil spamming (yeah let’s just call it what it is) is much much harder. WhatsApp especially is notorious for its anti-spam techniques. They block numbers at the slightest hint of potential large scale spammy behaviour, and 33k random numbers whom you’ve ever chatted with on WhastApp screams just that. 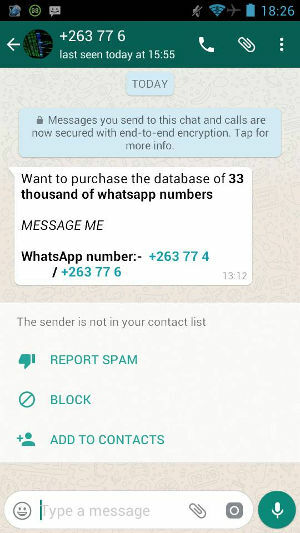 If you do receive such a message and decide to buy the database, even if those 33k numbers come cheap, know the risk is high of getting blocked from WhatsApp. And it’s not like WhatsApp uses 10 or so rules which you can study and create a cheat sheet. The anti-spam engine probably involves a lot of artificial intelligence with the system ever learning the new techniques spammers are employing to cheat it. I’d advise therefore that you don’t buy. It’s evil, but it’s also unlikely to work. I’d say don’t spam people on email as well, but then you’d argue that it’s working for you and that this is not America. So I’ll just wish you eternal hell (whatever that is in your religion) for all the sadness you’re contributing to the world. That said, I really wish WhatsApp would just open its API to businesses so all those people looking to use it legitimately don’t have to employ scam type tactics just to do marketing. It is a bad practice to sell and buy databases without consent of the persons within the database in Digital Marketing it is illegal and a violation of privacy and the customers rights. Yes this is not America, but it is unethical, one of these reputable brands will pay dearly for spamming sooner rather than later. Maybe WhatsApp will somehow accommodate business and marketing activities on their Application in a completely different way just maybe.